There is an American tradition of pickling and canning that goes back to the early settler days. Because of the seasonal uncertainty of food sources and the lack of refrigeration, it was really important to extend the bounty of the summer and fall harvests by putting up and preserving meats and vegetables. 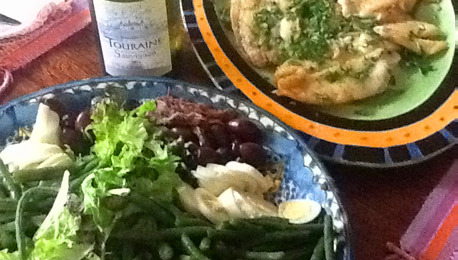 Pickling and brining foods provided special relishes, chutneys and sauces to liven up the monotony of winter meals. In the South, that meant chow-chow, a relish made of cabbage, onions, green tomatoes and cucumbers. 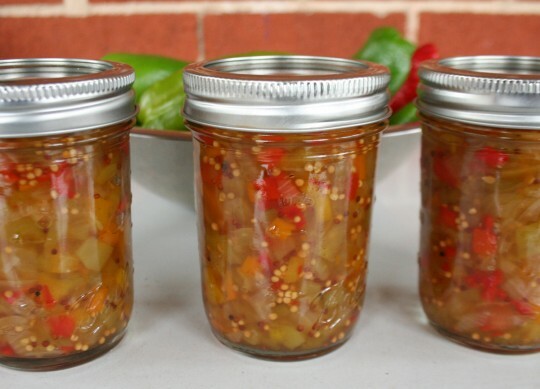 In the North and Midwest, that meant chutneys and piccalilli, a sweet pepper relish that was a mix of pepper and green tomatoes derived from the English version of Piccalilli, which was a variation on an Indian Pickle. Today, Piccalilli Pepper Relish is still a great way to use up all those sweet and hot peppers that start overflowing in July and August. It has a sweet and sour tanginess that is great as a condiment for pork roast or fried chicken, or greens. Like any good relish, you can also put it on hot dogs and in deviled eggs. You can really use it as a table condiment the same way you use salsa or ketchup. Even though I grew up in the South with a mother that liked to cook, she was a modern woman who worked full time. She did not have a lot of extra time to can fruits & vegetables or put up preserves. But one thing she did do was keep cut pickles in the refrigerator during the summer. Her version of a “quick pickle” was to slice the cucumbers (often from my dad’s garden) and put them into a bowl with water and a bit of salt. The salt water kept the cucumbers crisp and the fridge kept the slices nice and cold. Those pickles were meant to be eaten in a day or two. It was an easy thing to do in the morning before heading to work. Then, when she got home from work and had to pull together dinner, it was easy to pull out those cold, salty cucumber slices to serve with sliced tomatoes and green onions from the garden. That and some beans and cornbread were dinner. 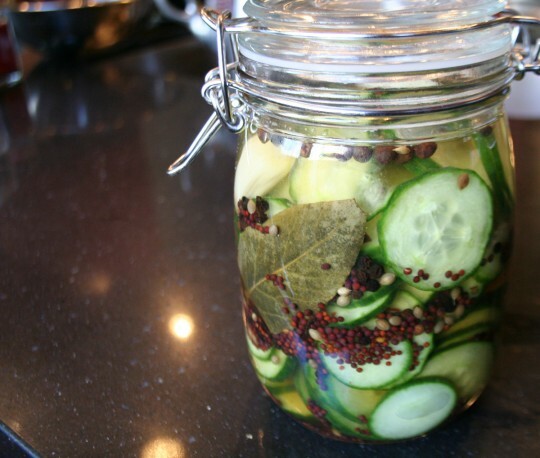 That salt brine has to be the simplest way ever to make a refrigerator pickle. I’ve used it many times myself. But in the last few years, I’ve been wanting to play around with making “real” pickles. There are two different ways to pickle cucumbers – refrigerator (or quick) method and the canning process method. I felt intimidated by the whole canning process, so I opted to try the quick refrigerator pickle. My family loves blackberry season. 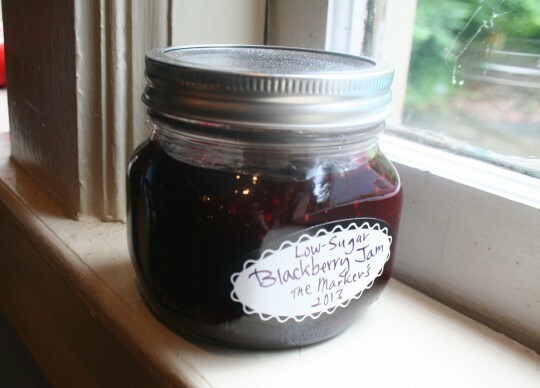 We can’t wait for the blackberries to come in every July so we can start our month-long ritual of berry picking and blackberry jam and cobbler-making. After three bug-bit, thorn-scratched excursions this weekend, we have already picked two gallons of wild blackberries. It’s not really a problem, but the berries are starting to get backed up in my fridge. It’s time to get serious about jam making. So, this week, I’m pulling my canning jars out of the closet and I’ll put up my first batch of low sugar blackberry jam for the summer.